This year’s Comic-Con International attendees will be among the first to get a peek at—and maybe even a copy of—RIP M.D., the new graphic novel from Lincoln Butterfield Animation and Fantagraphics Books. Exclusive preview copies will be available at the Fantagraphics booth (#1718), at $12.99 each. 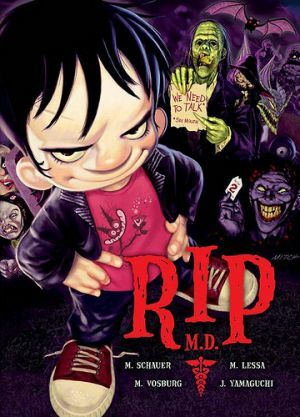 RIP M.D—the debut graphic novel from The Angry Beavers creator Mitch Schauer—is a creepy, fun-filled, all-ages adventure introducing Ripley Plimpt, an 11-year-old boy whose ordinary life is turned upside-down when he discovers that monsters are not only real, but are also in desperate need of his help to overcome their very real problems. RIP M.D. was written and illustrated by Schauer, an Emmy® Award winning producer, writer and designer. Comic book veteran Mike Vosburg has brought his innovative, illustrative style to the artwork’s inking, and Michael Lessa and Justin Yamaguchi have created a whole new look for RIP M.D. with their cinematic color and special effects expertise. Comic-Con attendees can meet Mitch Schauer and Mike Vosburg during a special autograph session at 10:00AM, Saturday, July 24, 2010, also at Fantagraphics Booth #1718.